The dead talk. To the right listener, they tell us all about themselves: where they came from, how they lived, how they died – and who killed them. Forensic scientists can unlock the mysteries of the past and help justice to be done using the messages left by a corpse, a crime scene or the faintest of human traces. 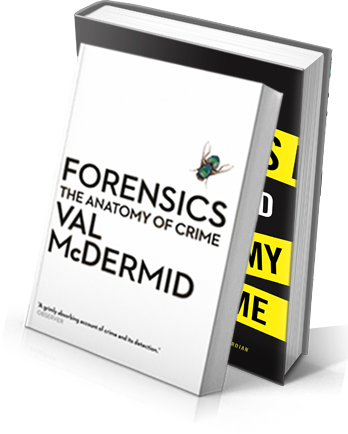 Forensics draws on interviews with top-level professionals, ground-breaking research and Val McDermid’s own experience to lay bare the secrets of this fascinating science. And, along the way, she wonders at how maggots collected from a corpse can help determine time of death, how a DNA trace a millionth the size of a grain of salt can be used to convict a killer and how a team of young Argentine scientists led by a maverick American anthropologist uncovered the victims of a genocide. In her novels, Val has been solving complex crimes and confronting unimaginable evil for years. Now, she’s looking at the people who do it for real. It’s a journey that will take her to war zones, fire scenes and autopsy suites, and bring her into contact with extraordinary bravery and wickedness, as she traces the history of forensics from its earliest beginnings to the cutting-edge science of the modern day. 2016 Winner of – Anthony Award for Best Critical/Non-Fiction book at Bouchercon in New Orleans. Where you see an innocuous wheel brace, Val McDermid sees a murder weapon, motive and killer plotline. Val has been keeping people on the edge of their seat for the past 25 years, presiding as one of the UK’s top crime writers, elevating the suspense genre to high art. Her endless reinventions of the genre have provoked shock and plaudits from critics across the world. Most recently, she’s turned her attention to the history of forensics and the real-life stories underpinning her creations. She traces the science all the way back to the investigation of a multiple stab-wound in ancient China through to the first autopsy performed by Julius Caesar. Here, Val takes us through science’s grisliest footnotes. The case of PC Sharon Beshenivsky, who was murdered in 2005, relied on the painstaking forensic examination of the crime scene and diligent detective work to find her killer.